Assuming that you haven’t been hiding in a forest for the last few months, you’ll undoubtedly already have heard of Root. 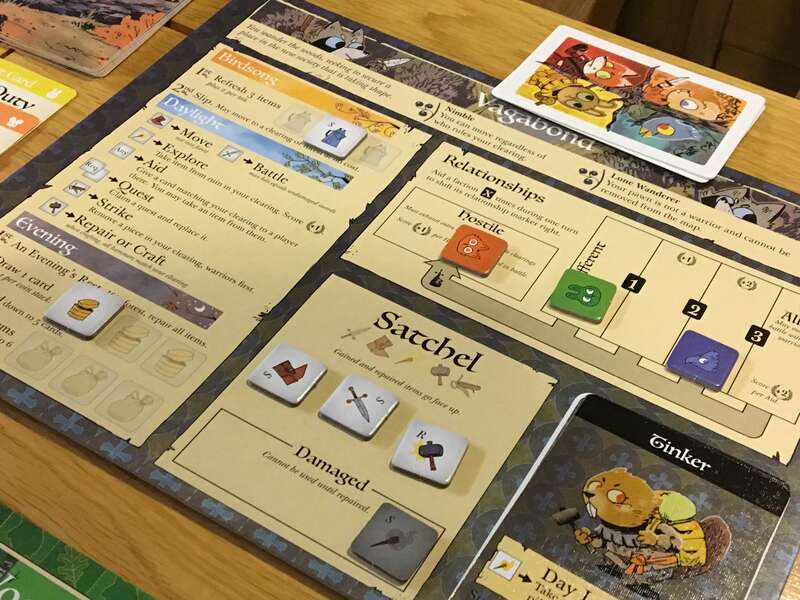 For those not in the know, Root is Leder Games follow up to the tricky but extremely clever dungeon-crawler Vast, which we reviewed earlier this year. Root takes the same idea of pitching asymmetrical factions against each other, but this time it does so in the style of a mid-weight wargame, which it wraps up in a beautiful woodland setting. Root is one of the most talked about board games of 2018 and it looks set to remain at the top of the boardgamegeek.com hotness list for the foreseeable future. Here’s our detailed review. 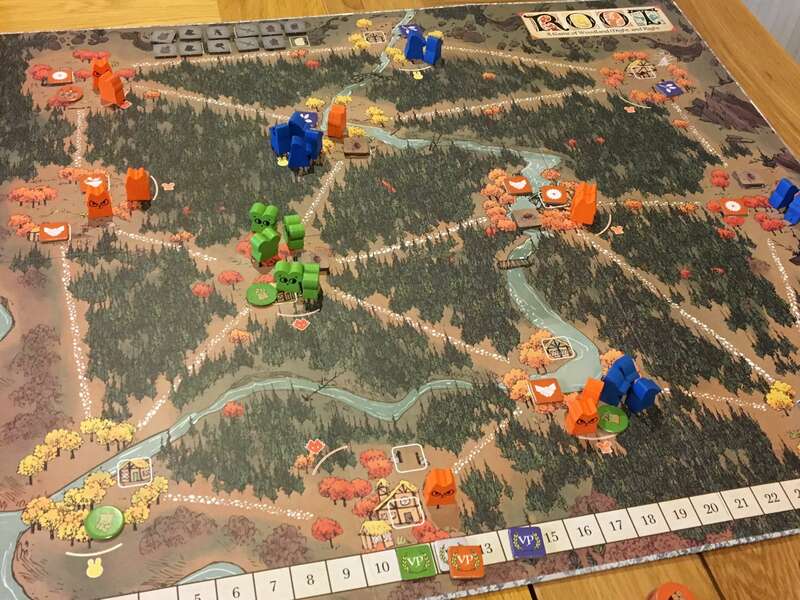 Root is a two to four player game in which each of the players will control a faction that has an interest in controlling the woodland realm that all of them jointly occupy. The most dominant power at the beginning of the game is the thinly spread Marquise de Cat, who in plot terms have wrestled control of the forest from the once proud talons of the hierarchical Eyrie Dynasties. The Woodland Alliance is the third faction and they represent all of the other animals, who are presumably sick of being lorded over by predators. Finally, The Vagabond flits between the other factions as he pleases, seeking simply to serve his own need to thrive and survive. If this setup sounds varied, that’s because it is. Every faction has its own initial board position and it’s own player mat, but that’s not even the half of what differentiates them. Most prominently, of course, is the strategy that each will employ and how they win the game. Every faction has a different way in which to progress their plan, although for the main three, they all boil down to claiming dominance of the woodland in which they live. The Vagabond plays slightly differently as I’ll explain later, but he has the ability to ally with another player and if they win, so does he. I’ll cover the different factions in more detail further into the review, but essentially these different approaches give Root the feeling of playing several separate games, although to a greater extent than in Vast, the destinies of each faction are closely linked. If you’ve ever played one of the GMT Counterinsurgency (COIN) games, then imagine that Root is like a smaller, tighter version of those games, albeit with an anamorphic, woodland theme. For anyone who hasn’t, those games are all about asymmetry on a grand scale and usually pit a large, dominant force like Rome or England against a smaller, more agile rebellion such as various barbarian tribes, or the newly declared United States. As The Marquise De Cat, you’ll have a large army, better access to buildings and more starting control – but you’ll be stretched thinly with the need to respond to multiple threats. The Woodland Alliance are the opposite and must keep the fires of rebellion smouldering in several places without attracting too much attention. The Eyrie plays entirely differently using a pre-programmed style that is powerful, but hard to master whilst the Vagabond player will only ever have one meeple to control, but she will have a lot more flexibility and a number of unique powers. Now, there’s no doubt that Root is highly asymmetrical in that each of the factions plays very differently, but as I’ll discuss in more detail later, I don’t think that the roles are quite as varied as Vast (although perhaps that will change once the already released expansion factions are introduced.) 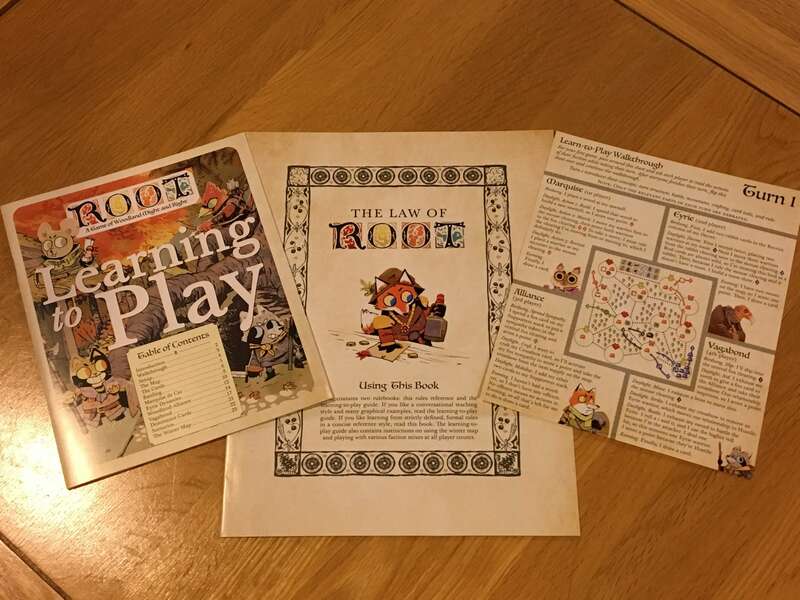 Root does take a while to learn and especially to teach, which leads to the need for one or two learning games when introducing new players. The game includes a brief walkthrough of the turn structure for each faction, as well as detailed setup guides and player aids that really help, but it’s something to be mindful of. Games that are as beautifully designed as Root make the job of describing them so much easier, although it’s always a challenge to remember every single detail, simply because there are so many. Firstly, as a general comment about the artwork (which is the singular vision of artist Kyle Ferrin) Root is unique and beautiful, with a style that mixes cartoonish characters with detailed, natural looking backdrops. Despite the smiling faces of the wide eyed rabbits, foxes, owls, eagles, cats and racoons that exist in this game world, there’s a darkness to some of the imagery that tells its own story and really brings Root to life in a beautiful, intense way. 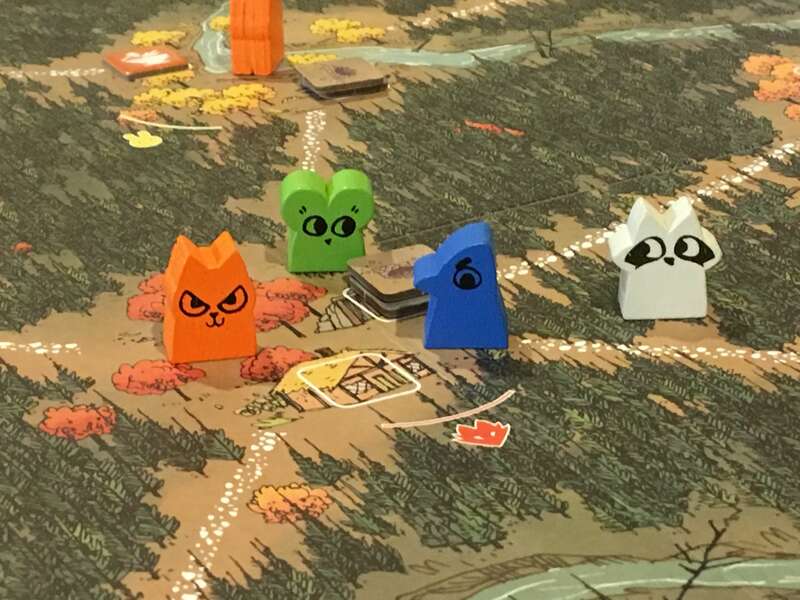 Root’s occupants are the cats, birds and small mammals (including a single raccoon) that make up the four factions, with each represented by colourful wooden meeples, each of which is printed with an expressive face. There are over fifty of these meeples in the box and I’d be very surprised if you find a single miscut or unpolished surface – the production quality of Root is second to none. You’ll also find cardboard tokens that represent buildings and other on-board elements. These tokens are certainly clear enough to use, but you know what? The selfish and overindulgent collector in me would have loved for these components to be wooden models as well. The woodland realm that Root takes place in is depicted on a gorgeous, clear and double sided map that features the same locations but shown in either autumn or winter. The autumn board is the one that you’ll see being played most often and which I suppose is considered the standard version, but the bleak, snowbound winter board is just as beautiful and thematic. Root also contains a large deck of cards that will be used to drive the action. This deck is very clear in terms of what it enables players to do, but whilst prominent enough to use, that data plays second fiddle to yet more incredible Kyle Ferrin artwork. The variety and quality of images on these cards cannot be understated and nor can the quality of the printing and overall card quality. Finally, Root contains a variety of literature and support for players to help them learn and teach the game, as well as to make the most of it on an ongoing basis. Chiefly among these is the manual, which I would say is fine without being amazing although it becomes increasingly useful as a quick reference as you become more experienced with Root. 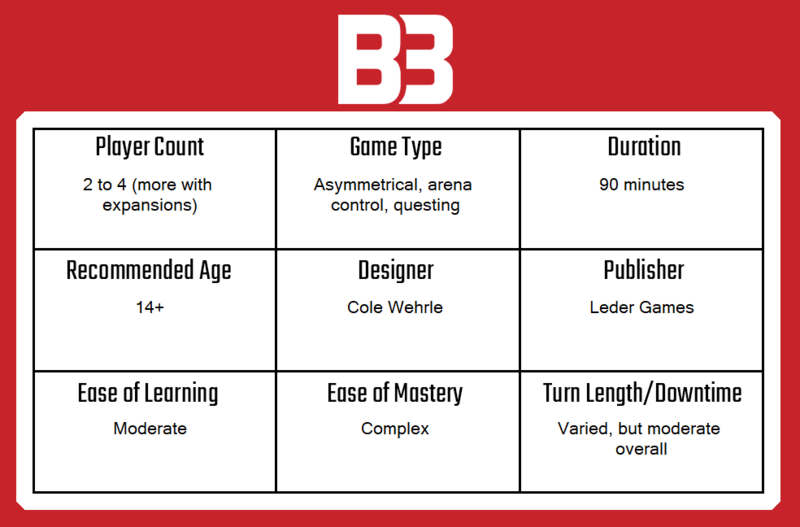 Better, especially for the brand new player, is the presence of setup guides on the back of every player mat, plus a tutorial that walks players through the first few turns. 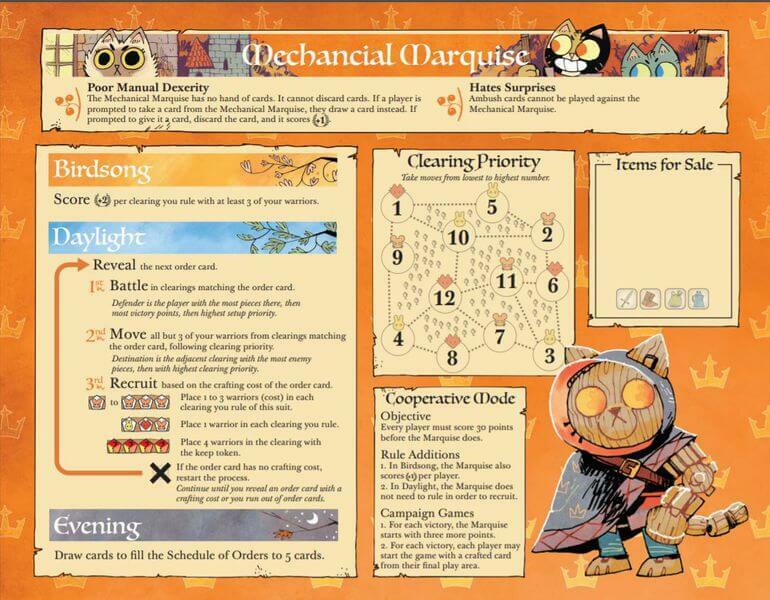 There is also the actual turn reference that is printed on the front of each player mat, which becomes very useful as players immerse themselves into their chosen role. I have to admit that when I decided to include a turn structure section in each review, I didn’t necessarily plan to accommodate games like Root, which have such high levels of asymmetry. That said, I’m going to give it a go, although I feel that I should caveat the following explanation on the basis that Root itself uses the manual, tutorial and player aids that I’ve already described to achieve the same thing, so what I’m going to tell you about how Root works is at a very, very high level of detail only. Let’s begin with the basic phases of the game. Each turn is split into three phases, known as Birdsong, Daylight and Evening. Whilst you might think that each player takes their actions for Birdsong before returning to the first player, who would then begin Daylight, that’s not the case in Root. Instead, each player (in turn, not simultaneously) completes their Birdsong actions, then their Daylight actions and then their Evening actions. The turn is structured in this way because actions often link to (or affect) others either for the individual player or on a global level and actually, for some factions, one or more of these phases will consist of very little elapsed time. The next basic principle to understand about Root is that much of the action is card driven. The deck of cards is shared between all players, with most of the drawing being done in the Evening phase, depending on the faction. The cards function as a control mechanism that enables players to take actions in locations that have matching symbols, with the intention being that you should always have something to do, but you may not always be able to do exactly what you want, to the extent that you want to. 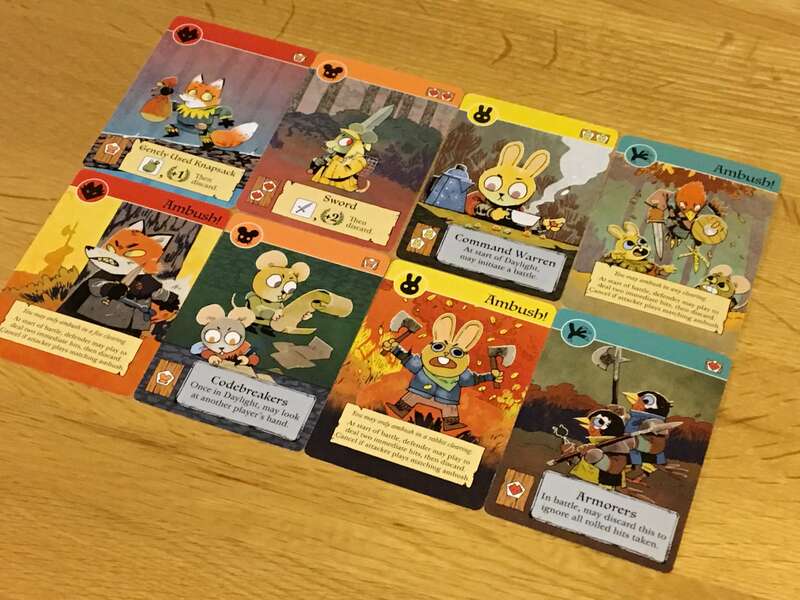 There are four suits of cards, including Birds, Foxes, Rabbits and Mice and the symbols on the board are fairly evenly spread. Birds act as the wild card, enabling them to be used in place of any other suit, for most situations. Now let’s look at some specific examples, beginning with The Marquise De Cat. On her turn, the Marquise will simply place one wood token at each of her sawmills during Birdsong, then she moves onto Daylight, which is where she will take most of her actions. In fact, she can take three actions that range from doing battle, moving or recruiting troops, building a structure (assuming she can afford it) or perform overtime. Overtime forces a sawmill to produce more wood at the cost of a card with a symbol that matches the overworked location. She can also spend cards from her hand to take additional actions and craft items. Finally, in the Evening, she draws at least one card, then if she has more than five in hand, she discards down. Now, if we take a look at the Eyrie Dynasties, then the style of play could not be more different. Instead of being freely able to take actions based on a traditional structure, the Eyrie must adhere to a formal structure based on planning and order. During Birdsong, one or two cards must be added to The Decree, which is a row of action slots along the top of the player board. There’s no limit to how many cards these slots can hold, but the Eyrie Dynasty player must be aware that should she be unable to complete any action, the Dynasties will fall into Disarray, which is always bad. There are a few other Birdsong rules for Dynasties players to be aware of, but the only one that happens every turn is the placement of a new decree. With the Daylight phase, The Eyrise Dynasties will take their actions by resolving The Decree, which happens from left to right and begins with Recruit, then Move, Battle and Build. Each of the cards in The Decree (bear in mind that cards are only ever added, not taken away) must be resolved in accordance with the normal rules for card suit and clearing symbol. Inevitably, at some point, this will become impossible to achieve and so Turmoil will be triggered, which removes all cards from The Decree (with some exceptions) and forces a change of leadership, which I won’t go into here. 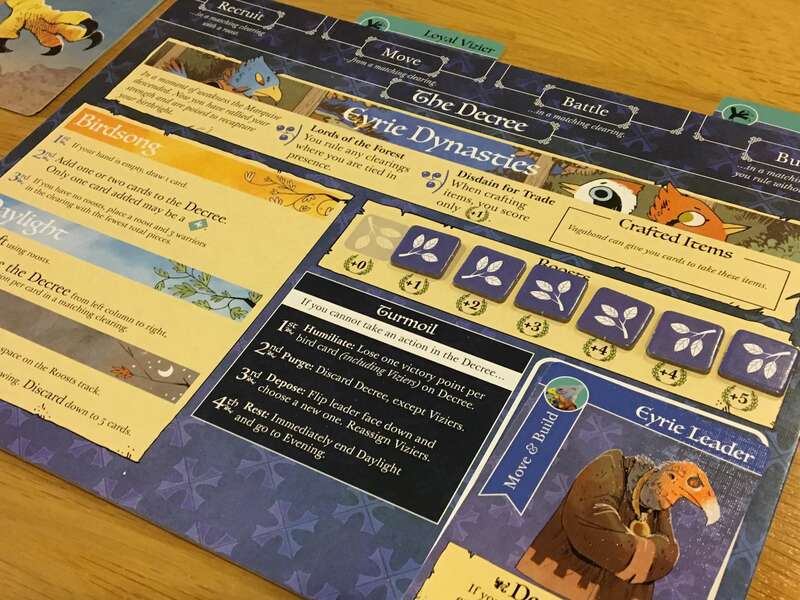 The Evening phase for The Eyrie Dynasties features the same card draw and discard process as for The Marquise De Cat, but the player will also score points depending on how many roosts she has on the board. The Woodland Alliance plays differently again, with no starting board presence whatsoever. Instead, this crew of furry underdogs must gather sympathy in order to revolt against the more powerful, predatory forces of The Marquise De Cat and The Eyrie Dynasties. Last but not least, The Vagabond works his way through hidden paths in the forest, collecting and managing items in his pack whilst carrying out quests to fulfill his own goals. He also has the unique ability to form relationships (both good and bad) with the other factions, which makes playing as him a fairly unique experience. Even where the Marquise De Cat and the Eyrie Dynasties are concerned, I have massively simplified the description of how Root play in terms of structure. That’s only because each of the factions comes with around as many things to note as an entire game might normally include and I can’t describe all of them in detail. It’s worth noting that none of the factions is individually complex, it’s just that being the person who owns the game and needs to teach it to up to three new players requires a fair bit of mental processing power. Much as when discussing the turn structure in Root, the experience you’ll have will depend largely on which role you play, which other factions are present and how many times you and the other players have experienced the game already. I am by no means a Root expert, but I have now experienced it from all four sides on probably two or three occasions each, which I think is actually around the minimum amount of plays you’ll need to log if you want to understand the game properly. I don’t think that Root is a hugely variable game in terms of setup, but it sure can be depending on who is playing and what they decide to do. The Eyrie Dynasties, for example, will begin with control over just one clearing in any corner of the board. Thanks to their ability to chain numerous actions together (if Turmoil can be avoided) then expansion can be rapid, especially since The Marquise De Cat will have her forces extremely stretched. Inevitably though, Turmoil will come and the pendulum will swing back towards the feline force, who will have been consolidating their power, ready to push back. Meanwhile The Woodland Alliance will be popping up to make a nuisance of themselves all over the place, whilst The Vagabond could be up to any of a number of unpredictable tricks, most of which will disrupt at least one of the other factions plans. Take any one of these factions away and everything changes, of course. I should also note that even in this first printing, the instruction manual includes further instructions for both The Riverfolk and The Lizard Cult factions. I haven’t played with these factions, but again, introducing them must completely change the game, especially if one or more of the base factions is removed. In Vast, the instruction manual allowed for the many, many combinations of different player characters by providing specific instructions for how to setup and accommodate each. Now please don’t misunderstand why I’m mentioning this. It’s not a negative point – it’s a huge positive. So many games introduce a veneer of replayability by introducing random setup elements or whatever, but Root achieves the same at a much deeper, structural level. Yes, it can be hard to teach Root as a result, and it can even lead to imbalances when one or more experienced players take on those who are still learning, but that’s fine really – it simply means that there are no stabilisers to hold back higher level play. I don’t feel like Root deserves to be branded as a light wargame (which is what a lot of people say about it) because I think it is too straightforward in its execution and because it draws from too many other areas. Where I think it is like a wargame (and perhaps the comparison is valid) is in the power and agency that it gives players. There are definitely good strategies and bad ones, all of which are available to explore and each of which might be more or less valid depending on who else is playing and what factions are on the board. On that note, perhaps where Root is less successful is when you might want to play just a basic two player game. In those circumstances, you more or less have to play as The Marquise De Cat and The Eyrie Dynasties, as otherwise the game will be very strange (not unplayable, but weird all the same.) I guess this might change as other expansions are added (including the available two that I haven’t yet played with) and perhaps there will be viable automa rules introduced by what looks like a thriving community. Root is therefore a strange one to recommend. If you’re a fairly frequent gamer with a regular group, I’d strongly recommend it. If you play infrequently, with low numbers of players or if you find it hard to bring the same people together on a regular basis, then it’s harder to suggest that Root is a good investment. That said, it is very mechanically sound and it looks very smart, making it an interesting, attractive and appealing long term proposition that I’ll certainly be keeping on my frequent play shelf for the foreseeable future. A copy of Root was provided for review purposes. You can find out more about it on the website of publisher Leder Games.